Nineteenth century French painter Pierre-Auguste Renoir was renowned for his captivating scenes of pretty women and sensual nudes. He was a founding member of the Impressionist movement in France and was one of the movement’s leading painters, although he stopped exhibiting with the group late in the 1870s. Renoir was born in Limoges on February 25, 1841. At the age of 13 he was already working as an apprentice painter, tasked with painting flowers as decoration on plates made of porcelain. His early training was carried through his more serious works, which were realistic but always decorative. When machines were used to decorate ceramics, he decorated screens and fans. With the money he had saved through his apprenticeship he entered the Atelier Gleyre in 1862, where he developed friendship with Bazille, Sisley and Monet. He later met Paul Cézanne and Camille Pissarro. The style he developed on his own had a great effect later on in the works of several avant-garde artists such as Picasso. While he started as a porcelain painter, Renoir had always aspired to be a professional artist. He started copying the works of the masters at the Louvre in 1860 and later sought formal instructions from Charles Gleyre, an academic artist. With the friends he has met at the atelier, they started painting in the nearby Fontainebleau forest. However, Renoir was more inclined towards portraits and figure painting. The early nudes that he created featured buxom figures. His palette was heavy on earth colors, showing Realist painter Gustave Courbet’s influence. Renoir, together with Claude Monet spent two months in 1869 painting at the bathing and boating establishment of La Grenouillère, which is located outside of Paris. Their en plein air paintings produced a sketch-like technique. To capture the effects of the sun through the trees, which passed on the rippling water below, they used loose and broad brushstrokes. Their palette also became bright because of the brightness of the available light. Their style provided the catalyst to the development of Impressionism. The Impressionism style of Renoir reached its peak in the 1870s. By this time he was working both in Paris and at Argenteuil, where Monet also produced so many paintings. Renoir still participated in the exhibits of the Impressionists in 1874, 1876, 1877 and 1882. He also became the founding member of the L’Impressionniste review, publishing an article that discussed the contemporary art principles. It was during this period that he produced some of his masterpieces, such as “Le Moulin de la Galette” and “Swing.” The models for these two masterpieces were mostly artists and friends as well as girls from Montmartre. He traveled to Algeria and Italy in 1881 and was fully impressed by the frescoes in Pompeii and the works of Raphael. 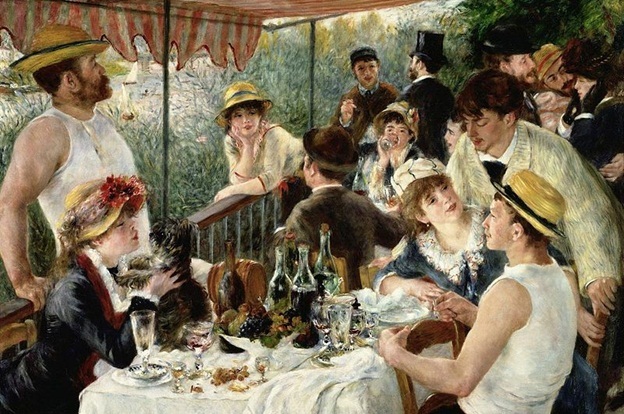 One of his most remarkable canvases, the “Luncheon of the Boating Party” was painted during this period. 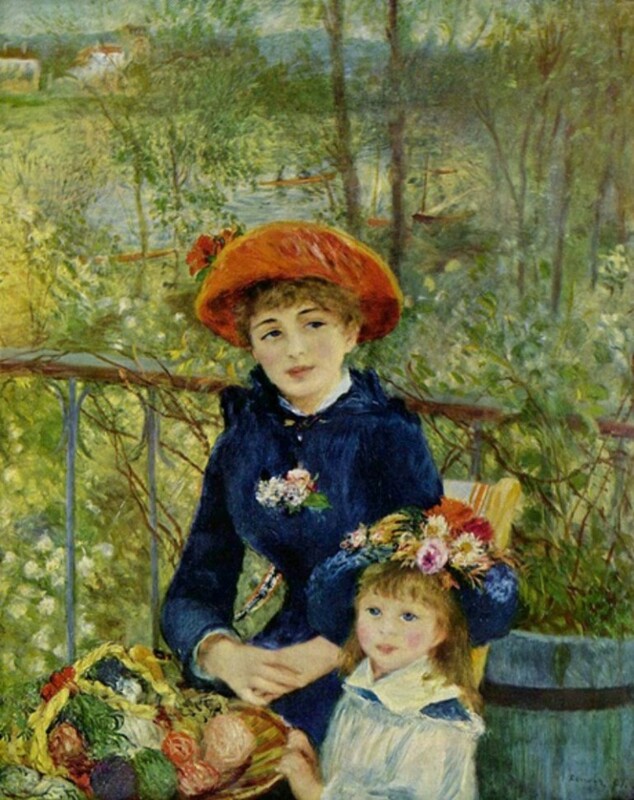 Renoir had a preference for portraiture, which attracted a large number of patrons. Soon Renoir became a very much sought-after painter in France. He gained financially from portraiture, particularly after the exhibition at the Salon of his painting of Mme Marguerite Charpentier and her children. He became a family friend and was often invited to their country house in Wargemont. He took advantage of his numerous times there to explore other genres, creating rich still lifes and various seascapes. He was also introduced to the American art patrons with the exhibition of 32 of his painting in New York in 1886. The celebrated art dealer Durand-Ruel was behind it. He and his fellow Impressionist painters were largely accepted in the American market, as evidenced by the number of Impressionist paintings hanging in several museums in the United States. The 20th century celebrates Renoir as one of the greatest modern painters of France. Even failing health and old age did not stop him to continue experimenting. He was an artist that did not compromise his art.